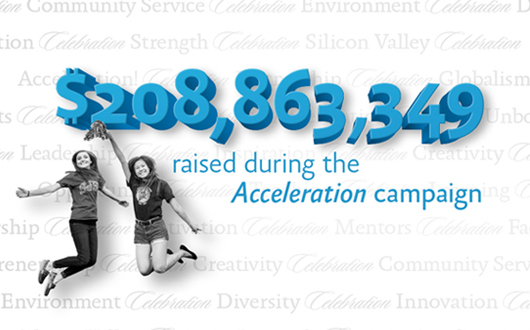 Strong support helped “Acceleration: The Campaign for San Jose State” exceed its goal and conclude one year earlier than anticipated. President Mohammad Qayoumi delivered the Fall Welcome Address on Aug. 19 in Morris Dailey Auditorium. Acceleration began in 2006 with the goal of raising $200 million in eight years from individuals, corporations and foundations. SJSU received more than 30,000 individual gifts, with half of the donors hailing from the Bay Area. The funds raised will support all seven colleges, the University Library, Student Affairs and Intercollegiate Athletics. Planning for the next campaign is underway. 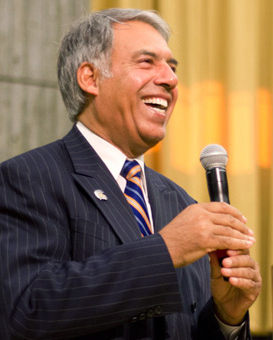 Using San Jose State’s strategic plan as a framework for his Fall Welcome Address to faculty and staff members and students, Qayoumi focused on the university’s five long-term goals, including “Unbounded Learning,” which encompasses all efforts to enhance student success through continuous learning innovations. The president highlighted enhancements across the disciplines, including engineering, business, education, math and computer science. Qayoumi also affirmed his commitment to San Jose State’s most controversial efforts, which have involved instructors experimenting with massive open online course platforms offered by edX and Udacity. President Qayoumi continued by describing progress with nearly a dozen ongoing or planned campus construction projects, reflecting SJSU’s strategic goal of developing “21st Century Spaces.” The president also declared the university budget structurally balanced for the first time in recent memory, applauding officials for passing the state budget on time and restoring support for the California State University system.